Castle Gardens is an urban park in the oldest part of the Lisburn, Northern Ireland. 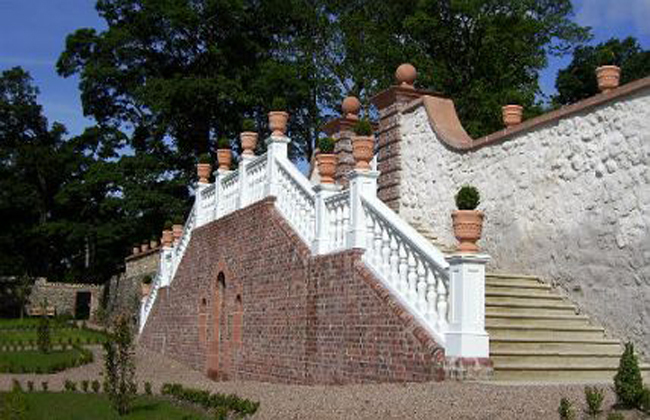 It dates from the building of Lisburn Castle, which overlooked a major crossing of the River Lagan, in the 1620s. Maintained by the Hertford Estate for public recreation since the Castle burned down in 1707, it was donated to the Corporation in 1901 after the death of the last Conway heir. The upper part of the Gardens, has been largely maintained in the layout imposed in the 19th century while the large south facing slope towards the river contains a series of brick built terraces in the Italian renaissance style. Abandoned and fallen into decay, these had been used as allotments and rented out to neighbours. The Gardens have now been restored with the aid of a 75% grant from the Heritage Lottery Fund. Highly Commended 2009 LI Awards Heritage and Conservation; Construction Employers Federation Award of Excellence in Restoration 2008, Certificate of Merit, ALCI Award for Best Commercial and Public Authority Project. Preparation of proposals to support an application to the Heritage Lottery Fund; preparation of detailed designs to tender document stage and a Management and Maintenance Plan, and implementation ofthe scheme. While the entire site is a Scheduled Monument, due to its importance in the seventeenth century, the total area restored is split into different character areas based on the age of the dominant remains. The materials and plant species chosen reflect this.On the face of it, the materials used in the area of the mid 1600s terraces are simple. Red brick retaining walls with red sandstone copings are contained within the original boulder stone boundary wall. Lime mortar is used throughout. However, due to the fact that much had been pushed out of line, or had been lost, each section had to be restored, according to condition and in association with Environment and Heritage Service.The need to preserve the original fabric insitu, as well as to rebuild lost sections, resulted in a variety of solutions and often an interesting coping line. Rebuilt sections and sections winched back to a vertical position, are pinned to a major system of precast concrete reinforcement.There being no evidence of the material used for the balusters and handrail, the decision was taken to use oak, with a linseed oil/lime paint finish. A denser grey sandstone was used for the treads as indicated by archaeological finds. Footpath surfaces are finished with local Lough Neagh gravel which would have been available on the owners estate. Planting to the terraced gardens is extremely simple and, with the exception of some of the fruit varieties, uses only plants which were easily available in the mid seventheeth century. The limited evidence for the planting of these gardens comes from a small series of letters written by the agent, George Rawdon, to Lord Conway. The only specific trees mentioned are Red Strakes, Golden Pippins and 'Base Sweepings'. It has been possible to acquire small numbers of the Redstreaks and Pippins and these are now growing on the top terrace. 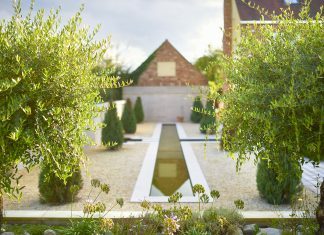 The remaining planting here concentrates on evergreen species used in a formal manner or fruit grown against the walls. A limited number of specimens include Arbutus unedo (Strawberry Tree), Laurus nobilis (Bay), Cydonia oblonga (Quince), Myrtus communis (Myrtle), and Mespilis germanica (Medlar). Bay is also used to the north of the top wall (south of the Bowling Green) and will be trained to form 'buttresses'. It is hoped that these will then form an additional deterrent to climbing on the walls without reducing the views over from the Long Walk. A very small amount of other planting in this section of the garden has been included to provide interest, and especially fragrance, at locations such as gate openings and adjacent steps. These include roses and honeysuckle, and around the seat at the west of the top terrace, wallflowers have been planted with the intention that they seed into other areas of the garden.